I'm pretty sure that lots of people have been making use of this double-dealing to enjoying 100% data bonus, it's not a new tweak, this same tweak was posted on this blog last year. This post is to let us know that the tweak is still working fine. 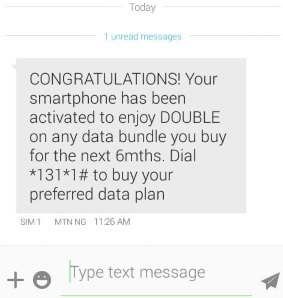 It's a great trick to get more value from your data bundle purchases, in the manner that, if you purchase MTN 1GB for N500, you will get an extra 1GB for free, making the total of 2GB instead of the regular 1GB allocated for that price. Also, if you purchase 1.5GB for 1k, you will get extra 1.5GB for free, making it the total of 3GB, if you buy 4GB for 2k, you will get extra 4GB, making it the total of 8GB, if you buy 10GB for 5k you will get extra 10GB, making it the total of 20GB etc. It is known as 100% data bonus. As usual, it involved IMEI tweaking, since the bonus is not meant for all the sim/smartphone, so you have to tweak the IMEI numbers of those little devices that are mapped out for this promo in order to benefit, but the major issue of this trick is how to get the valid IMEI, to be eligible to enjoy MTN Double Data Bonus. Below are the lists of valid IMEI newly generated for this purpose. After succeeding in IMEI tweaking, just go ahead and subscribe to any MTN data of your choice with *131*1#and you will be giving double of the data you bought. Don't forget to drop your testimony, if the method works for you and remember to use the share buttons for the benefit of others.